State troopers are asking for any information about the people involved in this crash (Source: Ramon Valencia). The crash happened at 2:10 p.m. on I-10 near Congress, according to AZDPS (Source: Ramon Valencia). 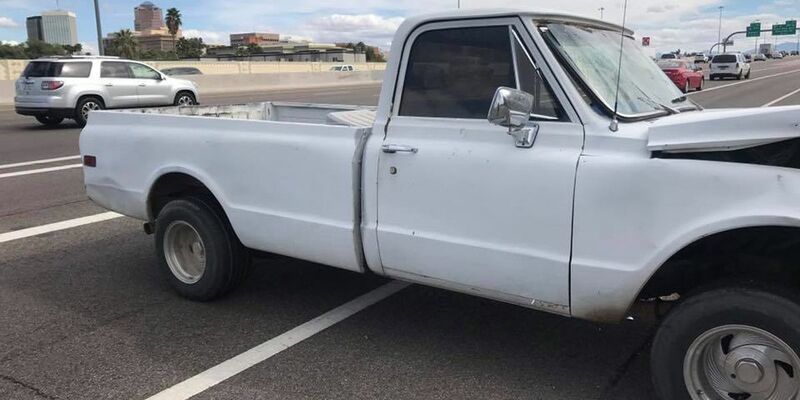 PIMA COUNTY, AZ (Tucson News Now) - State troopers are asking for any information about a hit-and-run crash on I-10 near Congress Street on Sunday afternoon. The two-car crash happened in the eastbound lanes at approximately 2:10 p.m., according to the Arizona Department of Public Safety Duty Office. Four people ran from a white Chevy pickup truck, one of two vehicles involved in the crash, according to the department. The driver was reportedly carrying a firearm and ran off to a nearby neighborhood, according to AZDPS. Another guy and two women hopped into a white sedan on the frontage road and left, according to an email from the Duty Office. State troopers believe the driver may have been picked up by another vehicle as well. None of the four have been found as of Sunday evening, according to AZDPS. Anyone with information about the crash or the people involved should contact state troopers or call 911. WANT MORE? Download the Tucson News Now app for Apple and Android devices. Temperatures were recorded in the mid 80s in Glendale on April 22. The students could still face discipline as the school continues its investigation.